I can still remember the reactions of my classmates when I told them I am going to complete my test quickly and go to meet my idol. I was in my early 20s, when meeting my idol was more important than my university test. Anyway, I did complete the test, I just left early. Also, I made sure that I did well in other assignments and final examination so that the final mark of the subject was not affected badly. That was the decision I made. After so many years, no one remember which subject or what mark did I get. But I remember the experience of the long queue and the warm smile from my idol. Thus, when my student told me, she “sacrificed” the Chinese language CA2 examination to try to complete for an arts project that she cares a lot; I was not shocked at all. Will you scold your child for getting this result? She failed her Chinese language CA2 examination. Even if she got 100 marks for her Chinese language SA2 examination, she would still need to face the music as overall she still fails the subject. 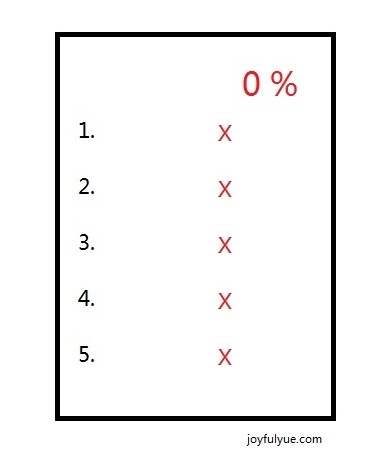 (a) What is the percentage of the marks of the arts project go to the final mark of the subject? (b) Likewise, what is the percentage of the marks of the Chinese language SA2 examination go to the final mark of the subject? (c) Which subject do you put in more effort? The one that you are weak at or the one that you are good at? The answers are obvious. We put in priority for higher percentage of the marks that go to the final mark of the subject and put in more effort in the subject that we are weak at. You may have different point of view, which leads us to the third point. In the end, she failed her Chinese language CA2 examination and did not complete the arts project. Also, the arts teacher has decided to extend the due date to one month later. What has she gained? For my case, I gained the experience that I cherish for the rest of my life, it was an once-in-a-lifetime experience. I won’t regret it and I can show my children and grandchildren of my idol’s signature. Most important of all, I did not fail the subject. For her case, I do think that it is too big a sacrifice. Things have happened, I hope she learn from this incident and make better decision next time. By Wendy in Education and Study on 18/08/2014 . Wendy, the course will be running again soon. Every student and student can benefit. Starts on the 3rd of October and worth doing, even if all you do is watch the lectures. https://www.coursera.org/course/learning I see that they have a preview of the lectures. They’ve left them open from my class. The most important thing I learned is the ‘pomodoro’ method to overcome procrastination – set a 25 minute time to work intently on a task, followed by a reward. Sleep and exercise are important, too – improves the brains ability to birth new neurons in the hippocampus (apparently that’s one of few places where a neuron does regenerate). You are right in marking the difference in what you did and what your student did. She should have divided her time between both and then her marks for both would have been better. Wendy, I’m just completing a ‘Learn How to Learn’ course on Coursera, and it explains about this sort of thing. You should never concentrate just on one subject intently. It’s best for the brain to be switching from one to the other as soon as you get stuck in one, because the mind works away in the background on making the right connections – making it easier when you come back to study again. Armed with new techniques, I wont’ be failing my ‘Effective Writing’ course again! Thanks for providing info on “Learn how to learn”. I am trying to teach my students on time management currently. Maybe I can add in other techniques for them.